Advocacy got a bad rap under the Harper government. The CRA’s audits of charities cast a chill on those voicing opinions at odds with the federal government. Although only one charity had its status revoked due to political activity (audits are ongoing), the prospect of an audit served to dampen dissent. Many, but not all charities, backed away from the advocacy work that is critical to systems change. The recent change at the federal level suggests that times are changing and the chill is lifting (see Time to Engage). We think it’s time to climb aboard the “A” train. Community voices matter and CRA’s policy on political activities acknowledges that charities have a legitimate role to play in public policy, “Through their dedicated delivery of essential programs, many charities have acquired a wealth of knowledge about how government policies affect people’s lives.”. Furthermore, non-profit organizations’ advocacy efforts have translated into significant progress on social issues including reductions in drinking and driving (MADD – Mothers Against Drunk Driving); reductions in smoking (Cancer Care Ontario); and the protection of environmentally sensitive landscapes (CPAWS – Canadian Parks and Wilderness Society). In Forces for Good, authors Crutchfield and McLeod Grant identify six practices of high-impact nonprofit organizations. All twelve of the organizations they identified as having created real social change engage in service delivery and advocacy. This was true of organizations that began by focusing only on services, as well as for organizations that started out focusing on advocacy work. The more organizations incorporated both functions in their strategy, the greater impact they achieved. The authors characterize the combination as a virtuous cycle. Service delivery enables organizations to implement ideas and work closely with communities on the ground. Through this work organizations acquire an understanding of needs, as well as an appreciation of how existing policies inhibit progress and what new policies might accelerate it. This in-depth knowledge of communities and issues is something policy makers may lack. Policy makers may also lack insight into the unintended consequences of existing policies and programs, and what kinds of new policies might resolve the challenges they’re charged with addressing. Canadian charities are permitted to engage in various forms of advocacy and to spend up to 10% of their resources on “political activities” that include a call to action (see Definitions below). Even charities viewed as prominent advocates rarely dedicate more than 5% of their resources*; of a potential spend of $20 billion, Canada’s nearly 86,000 charities reportedly spent $21 million (2012) or just over 1%**. If advocacy is key to impact, this is a significant missed opportunity. 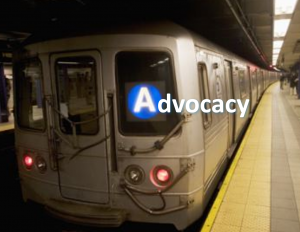 “Successful advocacy is most often the result of a medium-to-long-term, focused, sustained and collaborative approach to advocacy” – Sean Moore. Advocacy is a long game that requires long-term thinking and commitment. Progress can be slow and is not always easy to measure. The Chief Executive Officer (CEO) of one organization we have worked with (Participation House Support Services, London and Area) spends significant time building relationships with government and others working in the developmental and health services sectors. His board supports this investment of time and effort. The CEO’s relationships with decision-makers are characterized by ongoing information exchange and feedback on policies and programs introduced by government. These conversations have built trust, and the CEO is able to work with others in community services to effect policy changes and build solutions. The organization’s board members are also engaged in conversation with government and community. Many are long-term members who are deeply familiar with the issues faced by the organization’s community. Those in government have welcomed the opportunity to understand board member perspectives as senior volunteers. Over the last few years the agency has supported individuals interested in self-advocacy, something that has enhanced individuals’ ability to share ideas and concerns inside and outside the organization. In my thesis I focused on Sustain Ontario’s efforts to influence provincial food policy over a period of several years. The cross-sectoral alliance engaged in government relations and crafted policy solutions for government’s consideration. In part because they cultivated relationships with members of all parties, their efforts to share information, ideas, and policy solutions were given consideration by policy makers. Some of their ideas were incorporated into Ontario’s Local Food Act. Giving permission: as the board did with the CEO above. This might extend to supporting investments in advocacy capacity building for the organization and its clients. Adopting a systems mindset: considering the root causes impacting the organization’s work and all those invested in resolving the issue. Amplifying voice: sharing issues and stories with stakeholders outside the organization. Engaging decision makers: building relationships with local, provincial and federal politicians to better understand their priorities, values and timelines. Sharing information and possible solutions. Identifying windows of opportunity: supporting the organization in crafting a timely and strategic response to an event that focuses attention on client or organizational issues. What critical conversations and questions do boards need to engage in related to advocacy? The sample questions below are crafted for organizations that are just starting out, and those that are already actively engaged in, advocacy efforts. As a charitable organization what issues CAN we advocate for? What percentage of our resources are we investing in advocacy? Are we reporting these correctly? How might we measure the return on this investment? What specific issues might we advocate for that would make the biggest difference for our community and cause? What issues related to our cause are receiving significant public attention and how could we use that attention to expand awareness and/or get our issue on government’s agenda? What do we understand about these issues based on our programs/services /clients that would enrich the current discussion? How might we support our community in speaking out? How is limited attention to advocacy a disservice to those we serve? What non-traditional ‘allies’ in the sector, in business, and government might be interested in working with us? What networks do board members have that would help us connect? What bold goal might incent others to act? Advocacy: CRA defines advocacy as demonstrated support for a cause or particular point of view. Advocacy activities may include public awareness campaigns, a representation to an elected representative or public official, participating in a policy development working group, among other examples. See also the link to CRA resource below. This might involve: supporting, pleading, or defending a cause; expressing your views to create a shift in the environment, mobilize resources, change public opinion, or influence someone’s perception or understanding of an issue. CRA defines three categories of advocacy: unrestricted, limited and prohibited. Limited: this includes political activities such as a ‘call to action’. Charities can devote up to 10% of their resources. These activities must be non-partisan and connectedto charitable purpose. Charities must declare these expenditures in their T3010 forms. Lobbying: to undertake activities aimed at elected and/or non-elected government officials to influence them toward a desired action. Public Policy: the intentions, decisions or actions of government. Public policy sets out the “what and how” of something that is to be done and may be expressed through laws, regulations, procedures or expenditures. Government Relations: to monitor government actions or build relationships with elected and/or non-elected officials in order to increase their awareness about one’s cause and organization. Charity Case: How the Nonprofit Community Can Stand Up For Itself and Really Change the World. Dan Pallotta, 2012. And TED Talk: The way we think about charity is dead wrong. **Political activity by registered charities in Canada. Elson, Kobrinsky, Marshall and Millan. Government of Canada presentation. February 1, 2014. “Public Policy and the nonprofit sector” Susan Carter, The Philanthropist. Volume 23.4. 2011. “Rebalancing society: Radical renewal beyond left, right and centre” (PDF). Henry Mintzberg, self-published, 2015. “Secret of Scale – how powerful civic organizations like the NRA and AARP build membership, make money and sway public policy”. Peter Murray. Stanford Social Innovation Reviews, Fall 2013. *Stephen Harper’s CRA: Selective audits, “Political” activity, and right-leaning charities. Broadbent Institute, October 2014. Tools for Radical Democracy: How to Organize for Power in Your Community. Joan Minieri, Paul Getsos. Jossey-Bass, 2007. This entry was posted in CRITICAL CONVERSATIONS and tagged Advocacy, Engagement, Government relations by VMS. Bookmark the permalink. Great and timely blog. At St. Stephen’s Community House we have a Board Advocacy Committee that is very active and will love to read and discuss this blog. Great work! Hi Bill – great to hear you have a Board Advocacy Committee. Would love to hear more about that, please let us know how they respond. A timely article for Success Beyond Limits. Thank you! The challenges arising for organizations with a small staff to engage meaningfully in advocacy and also fund raising are daunting. Your article will help us as we continue to address these challenges and to engage our Board members.